Gaya Travel Magazine finds that there’s no other better time for than now for Asian travellers to visit Jordan, a reassuringly safe and secure country despite being located in a tumultuous region. Poor in natural resources but rich in history and heritage, the nation of Jordan had hosted various civilisations throughout the ages. The modern kingdom of Jordan was established since 1921 by King Abdullah I, who was part of the Great Arab Revolt that ousted the Ottomans from the Arabian Peninsular, thereafter placing the country as a British protectorate. On 25 May 1946, Jordan gained independence from Britain. In 1951, King Abdullah I was assassinated at Al Aqsa Mosque. His Majesty was succeeded by his brother King Talal, who only remained on the throne for about one year before succumbed illness and passed over the throne to his son, King Hussein, who was only 16 years old. King Hussein reigned over Jordan for 46 years, died in 1999 and succeeded by the current monarch, King Abdullah II, who is the 43rd generation of Prophet Muhammad. Throughout our trip in Jordan, we relished on the healthy diet of humus, baba ghanoush, tahini, tomatoes and olives followed by hearty entrees such as grilled meats and non-starchy rice dishes on daily basis, which we enjoyed. Jordan as a destination is not about appearances and first impressions, but it is more about looking beyond the physical and instead appreciate its past, heritage and character. Yes, Jordan is expensive and yes, Jordan might not be exploding with numerous tourism objects and attractions compared to the other Middle Eastern tourism heavyweights like United Arab Emirates or Egypt. However, what Jordan has that the rest of the world doesn’t have such as Petra, Wadi Rum, Ma’in and the Dead Sea are ultimately compelling and strongly worthy in attracting travellers from near and far to visit the kingdom. If you are not holders of USD, EUR or GBP currencies, try exchanging your money to Jordanian Dinar (simply called JD) at your home country if possible – the exchange rate might be more favourable at home. Otherwise, bring hard currency such as USD, Euro or GBP. Be sure to only exchange the amount that you think you are comfortable in using entirely or most of your JD – if you are left with too much of it, exchanging it back to your currency other than USD, EUR or GBP might be frustratingly unfavourable. When we first exhanged our RM to JD, it was RM6 to JD1. After returning, when we exchanged our JD back to RM, the money changer only take RM4 for JD1. Travellers from Malaysia and Singapore do not need prior visa clearance and instead can obtain visa upon arrival at a fee of JOD40. Groups of five persons or more arriving through a designated Jordanian tour operator with a government certified tour guide are exempt from all visa charges, provided that the group arrives and departs together as well as stay a minimum of three nights in Jordan. Visit international.visitjordan.com/generalinformation/entryintojordan.aspx for more information. Jordan is one of the most expensive countries in the world, while Amman is considered as the most expensive city in the Middle East. ON the same note, it is a nation that is politically stable and has low crime rate. 70% of the country’s land is arid desert – it snows from December to January, especially the south. Jordan only receives an average of 600mm annual rainfall. Since Jordan lacks water, it intends to explore underground. According to geological studies, there is a huge amount of water under Wadi Rum that is expected to last for 50 years. When in Jordan, travellers must be ready to pay JD1 (RM6) for a 1.5 litre of bottled water (we recommend that travellers consume four to six litres of water, especially during summer since Jordan can get really humid). Besides, travellers to Jordan also need to be mentally ready to pay JD1 every time when they enter the toilet at the rest area along the Desert Highway or giving tip for good service. Jerash is one of the cities along the King’s Way that was established since 3 A.D., which is the best preserved Roman site in the East. 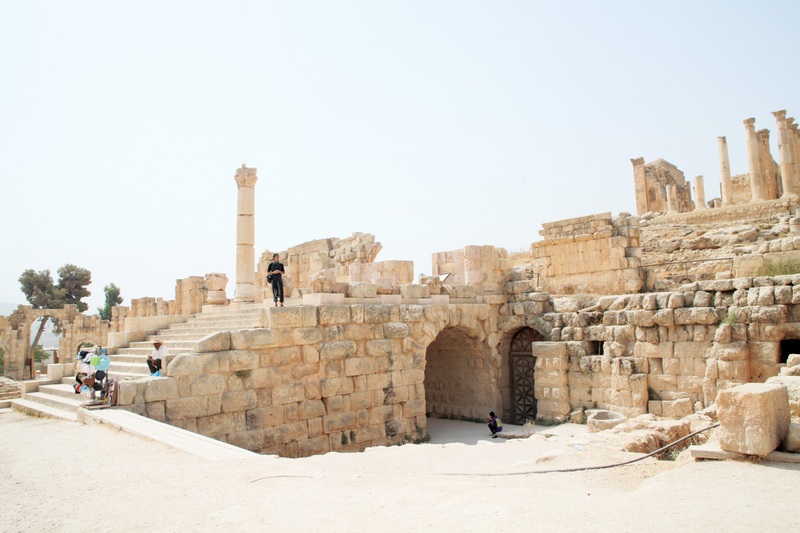 Jerash was also part of the Decapolis, the network of 10 cities in Jordan and Syria connected along the King’s Way. 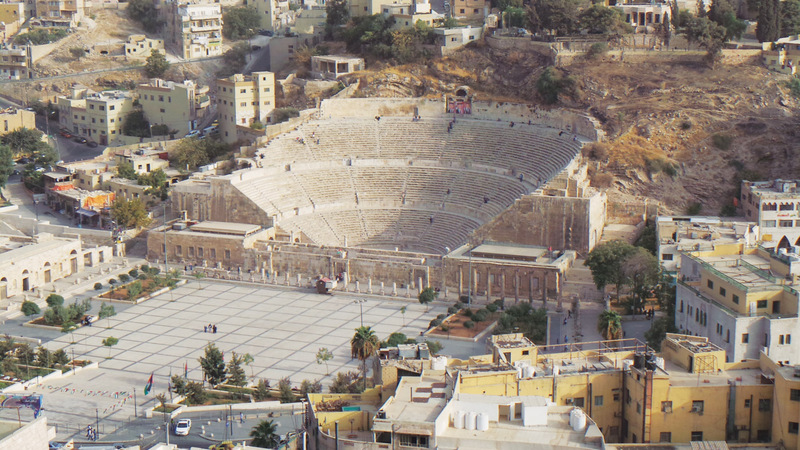 Jerash, or Gerasa in Latin, is the best preserved imperial Greco-Roman site in the east. People say that it was established by Alexander the Great, but findings of archaeology indicates that the area had been settled even longer, around 6,000 years ago. At its height, it was believed that 25,000 people resided in the city, which was the second half of 1 century A.D. Unlike Ephesus in Turkey, Jerash is not a place that make you fall in love at first sight, but it grows on you and garners your respect as you get to know it better. The site is rich with ruins and vestiges of Greco-Roman rule such as the Greek inscriptions on one of the arches into the city called the Arch of Hadrian that indicate the arrival of Emperor Hadrian to the city as well as honouring him (Hadrian reigned from 117 A.D. until 138 A.D.). This iconic arch is also known as Bab Amman (Amman Gate) since travellers then need to pass through it to head to Damascus. Besides that, travellers would also be awed by the remnants of a hippodrome, the unique Oval Plaza or Forum that is surrounded by fine columns and traces of networks of ancient underwater system underneath the long colonnaded street or cardo (an 800-metre street connecting the North Gate to the Oval Plaza with large sewer system underneath), amphitheatres and baths – the ancient city’s wealthy citizens were believed to have built these structure through donations. The Romans created roads connecting to all cities including those in the Nabatean kingdom, especially during the prosperous time of the Roman Emperor Trajan who reigned from 98 A.D. until 117 A.D. Trajan instituted extensive public building programmes and social welfare policies, earning him the title as one of the Five Good Emperors. Many earthquakes then hit Jerash after 7th Century A.D. Modern day Jerash saw the arrival of Chechens to the area in 1880s, who then built their houses close to the ruins and used their stones. Half of Jordan’s population live in Amman, the country’s political and economic hub. 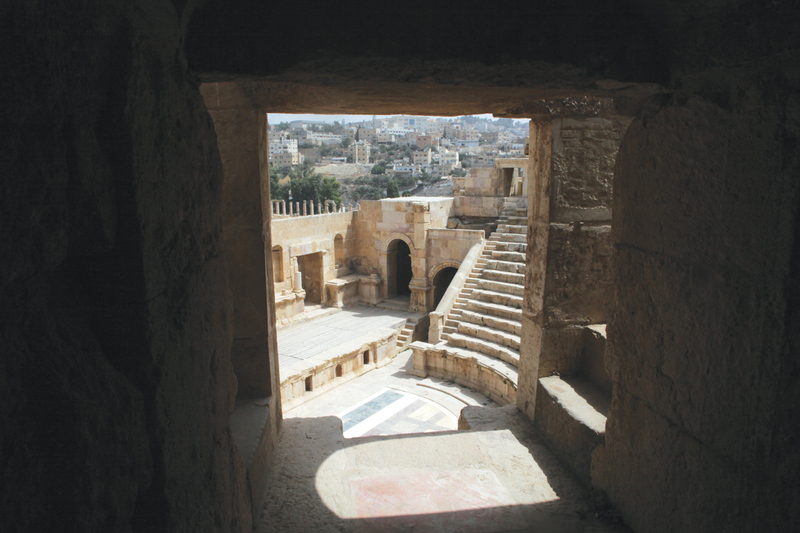 Amman – inhabited for over 10,000 years, began around the ancient site known as Jabal al Qala’a (Amman Citadel), which is deemed as the precursor to modern Amman. According to archaeological excavations revealed that humans began settling in the area around 7,000 years ago. It was called Rabbath Ammon (which eventually morphed into Amman as we know today) since the beginning of the Iron Age in 1,200 B.C. The site is indeed an impressive open-air museum that bears the remnants of past civilisations that had called the area home. Throughout the ages, it had endured numerous sieges, wars and earthquakes. The name was also changed to Philadephia during Roman rule, which gave the city the classical Greco-Roman style. In 661 A.D., the Muslim Umayyad Caliphate began taking control of the city and called it Amman henceforth, which is stuck to this day. Travellers can see vestiges of the past civilisations such as water systems comprising water channels and cisterns, traces of the Temple of Hercules built by the Romans, the Umayyad Complex and ancient colonnaded street – each civilisation built on top of what was left behind by the previous one. The Amman Citadel is also the place where travellers can visit Jordan’s National Archaeological Museum that exhibits artefacts, like pottery vessels, statues and coins found in Amman, including other sites throughout Jordan. Take the opportunity to capture the quintessential panoramic images of the surrounding Amman city from Amman Citadel’s various points – travellers will be able to appreciate more of Amman’s incredibly hilly terrain from there, especially the view of the ancient majestic Roman amphitheatre down below that contrasts with the surrounding modern buildings. 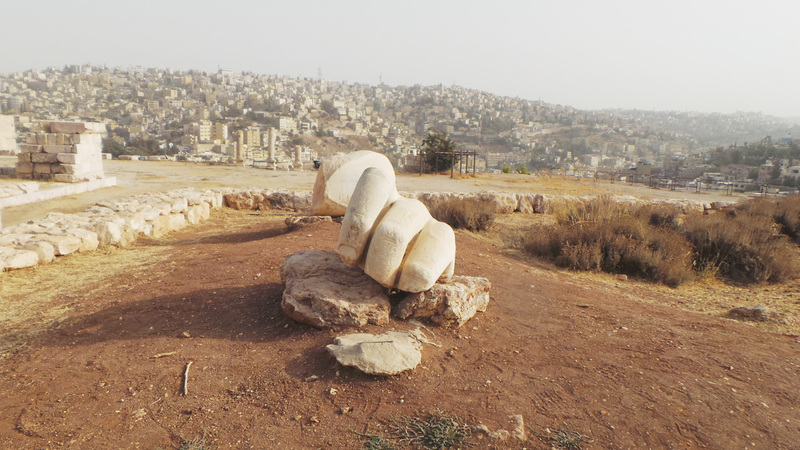 Travellers can notice from here that the houses in east Amman are mostly in sandstone, while those in west Amman are limestone. Visiting the Dead Sea is a must, since it is only 70 kilometres from Amman. The Dead Sea attracts travellers from near and far who come to soak in its waters due to its health properties. “The Dead Sea products are also good for people with asthma,” said our guide Mohammed Al A’weimir. It is indeed refreshing to experience floating on the Dead Sea without worrying about sinking – travellers could even easily read a newspaper or book while floating. 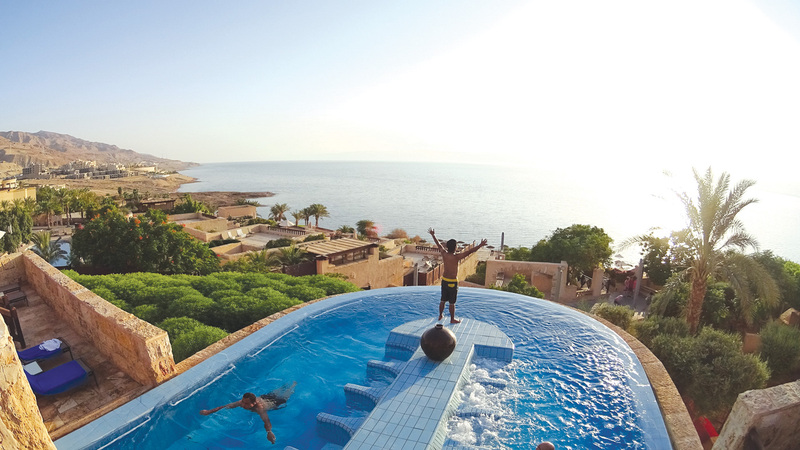 There are a string of resorts along the shores of the saltiest waters on earth – we had the chance to stay at Moevenpick Dead Sea, a cheerful, vibrant and expansive property that is bound to put its guests, especially travelling families, in awe. Besides its welcoming atmosphere, the resort also boasts one of the best spas in the area, called Zara Spa, which has received many accolades due to its impressive facilities that not only comprise efficient treatment rooms and efficacious treatments, but also several outstanding pools. Our favourite is the Hydro Pool, a large heated outdoor pool that is equipped with massage jets and lounges for guests to utilise before or after receiving treatment. For travellers to enjoy floating on the Dead Sea, travellers need to be reminded that it is best not to shave because it will definitely sting – it goes the same for nicks and wounds. Trust us: parts of your body that are covered by thin layer of skin will definitely feel the sting, but once you rinse the water off, your skin is bound to feel smooth. For better effect, slather your skin with the Dead Sea mud that contains nutrients that help to rejuvenate the skin. Keep lying on your back when floating so that your face will not be in too much contact with the water. Remember not to let the Dead Sea water come in contact with your eyes because it will definitely feel like burning. This luxurious and inspiringly understated property is located 300 metres below sea level, thus temperature at the resort tends to be higher in Ma’in, warranting travellers and guests to sufficiently consume water to avoid dehydration. Since the resort is located in a valley, guests are bound to appreciate the resort’s dramatic landscape and vistas. Mr Suleyman, the Guest Relations Manager for Evason Ma’in, explained to us that the resort owners intend to create a property that is strong in character and sense of place, while respecting the integrity of its natural surroundings and resources – the resort is indeed a destination in itself. Evason Ma’in alludes to Jordanian culture and influences through soothing and sumptuous earthen tones. 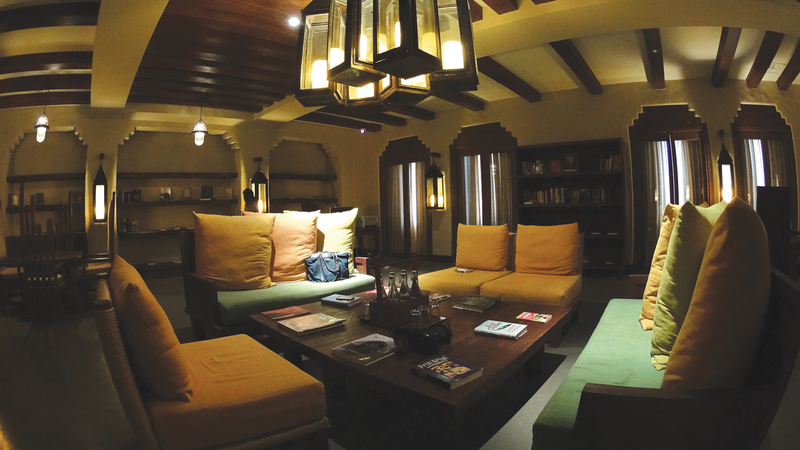 The resort is replete with wooden furnishing that further accentuates its appeal as a rustic exclusive getaway that brings guests closer to nature. One of Gaya Travel team’s favourite spots within the resort is the terrace outside of ‘At The Spring’ all-day dining restaurant, which offers guests the splendid view of falling hot spring water that flows into the resort’s thermal pool where guests should find time to soak in due to the water’s curative and therapeutic properties. Guests also should take the time to cycle around the area to enjoy the scenery around Ma’in, besides walking around the property’s grounds that are full of interesting pathways, walking trails, corners and spots for rest. It is also recommended that guests check out Evason’s renowned Six Senses Spa that offers signature spa treatments designed to relieve and rejuvenate. The spa also has exclusive thermal pool containing recuperative hot spring water supplied (more like falling) directly from the opposing cliff face, creating a mesmerising view, allowing the tired mind and weary body to unwind and relax.